Adrian D´Marco discovered his passion for magic in the third grade when he happened upon an old magic book on a library shelf. He had no idea that this book would, quite literally, change the direction of his life. In fact, from that day forward the idea of becoming a professional magician would never leave his mind. Afterwhich, he made a point to learn as many amazing illusions as he could, which he enjoyed performing for his family and friends. Like most kids his age, he dreamed of going to Disneyland and at age 13 he found himself at the world renowned amusement park. To his delight, he discovered much more than he could have ever imagined. Disneyland, you see, has a magic shop like no other and Adrian spent countless hours that day watching the magicians perform an endless array of astonishing magic. Indeed, he was so smitten with each show that it wasn't until later that he realized he had missed seeing most of the park. During his high school and college years, Adrian was focused on his education. He graduated high school and went on to earn a Master’s Degree in Education at the University of Texas at El Paso. His love for magic, however, never wavered. Adrian refocused on his dream and enthusiastically studied every magic book he could get his hands on. His family and friends soon realized that his skills had improved dramatically and they encouraged him to perform professionally. Soon people were asking him to perform at small venues. It was then, Adrian realized that the time was right to develop a professional show. For that reason, Adrian devoted endless hours to honing his close-up and stage illusion skills. 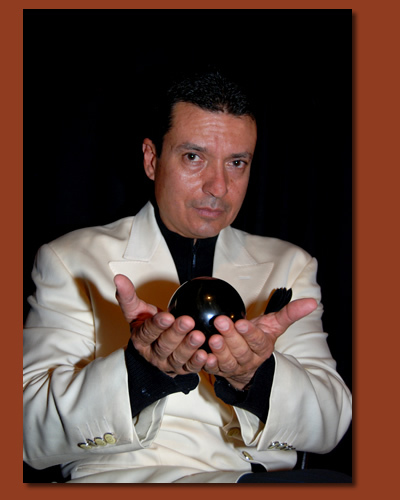 His goal was to develop an elegant magic show with polished and mystifying illusions. Within a short while, Adrian’s childhood dream of becoming a professional Illusionist had come true. Now, his dreams can be your entertainment. So why not call today!